THE MODERATOR: We are joined by race-winning crew chief, Adam Stevens. We will open up the floor for questions. Q. You got your wish. He waited till Sunday. How does it feel? ADAM STEVENS: It's pretty cool. The 200 deal, it's awesome. It's important for people to remember, it's not my 200th win by any means. But it's cool to be a part of his career. He's as good as they get. Probably be a first ballot Hall of Famer. I don't know how anybody could argue that. To be that close to that level of talent, help him achieve what he's achieved is a tremendous honor. I don't take it lightly. I never have. You guys have probably heard me say that before. Get him to Victory Lane a few times, be a part of it on the Xfinity side, tart a Cup championship, a few Cup races, now to be part of his 200th win, I hope I'm there for 250. Q. In the last 36 times he had led the most laps in an Xfinity race and had not won, he only won one of the Cup races the day after. Do you do anything after he has a race like yesterday to make sure he's ready to go? ADAM STEVENS: No, but I'm probably going to start now that you pointed that out. That's ridiculous. I had no idea. I think we've all seen a lot of growth in Kyle through the years. I've seen the most not behind closed doors, not dealing with him on the team. He's always been as good as he possibly could be in that regard. The frustrations through the weekend and on the racetrack affect him less than maybe they did a few years ago. I wouldn't expect that stat will hold true in the future. Now that you pointed it out, probably not surprised. I'm surprised at the magnitude of that stat, but that that stat exists maybe not. He just operates at a whole different level now. Q. Before the last pit stop, he was talking about he was afraid to make an adjustment. You said, Don't be afraid. How much is it having learned how to coach him? In that sense, why did you say not to be afraid? ADAM STEVENS: I mean, I was really just busting his chops. The car was pretty finicky today. We never made a wedge adjustment or track bar adjustment, it was just air pressure and a piece of tape all day long. We kept bouncing from one side to the other. When you get these things right, they can be that way. Certain tire combinations are worse than others. We were a little tight. We adjusted. We were too free. We adjusted again. We were too tight. I didn't want him to not tell me what the car was doing because we were learning about the magnitude of our changes. I didn't want him to forecast his impression upon what we were going to do. I just wanted him to tell me what it was doing. Every time that we made an adjustment and got his feedback, we got a little bit closer with the next one. He was cautious to get it on the loose side, not be able to use the throttle like he needed to. I was busting his chops a little. I just wanted his honest assertation [sic] of what the car was doing. Q. How often do you do that, bust his chops? ADAM STEVENS: At least once a race. I had a pretty good opportunity early in the race, didn't take it. All week long. You have to enjoy yourself. We operate at a pretty high level of communication, know how to take each other. We try to keep it light. Q. What was the situation? ADAM STEVENS: When Denny was running us down at the end of the first segment. The gap had closed quite a bit. He didn't hear how much the gap had closed, sniped at me a little bit. I let it go. I was ready to tee him up, but I didn't. Q. A question concerning the tire wear. You mentioned you adjusted the air pressure. We saw drivers having problems with tires. You were not concerned this could have happened to Kyle? ADAM STEVENS: We weren't concerned by the amount of wear. This is a place where you really try to push. The air pressure is pretty low, lower than what makes Goodyear comfortable. Tire issues, not having intimate knowledge of their situations, maybe they ran something over. Generally you see a lot of failures here because people get too aggressive pushing the air pressure down. That coupled with running on the apron can really hurt the left sides. There's a lot of bumps on the backstretch that can tear the sidewalls up early in the run. That was the concern, not the actual wear of the tread. Q. Do you think one of the biggest keys of your success with you and Kyle is the fact that you can bust each other's chops, but at the end of the day nobody's feelings are hurt? ADAM STEVENS: I think the key is communication. How that manifests itself, we communicate well. We both have the same goal. We work toward that same goal. Everything that happens in between coming in the garage and leaving the garage we pretty much leave here. We do a real good job of learning from our mistakes as a team, always looking forward to moving forward. I think it all just comes down to communication. Q. Beginning of the race it was trashy outside, a lot of trash. Was it key to come down on pit road and try to clean off the grille? ADAM STEVENS: It's something that's a concern. I'm sure every car in the field picked up some debris at some point. As race teams we've gotten a little more savvy about how to deal with that on the racetrack. Really wasn't an issue. We never had temps climb. Out here, windy the last few days, wasn't windy today, and that stirs up a lot of stuff. It's very common to pick up debris here. We've all found ways to deal with that. Q. After the pit road speeding penalty, you were very adamant on the radio, We don't need to get this immediately. Here is a veteran driver. Are you saying that as much for yourself? Why did you need to say it for somebody that almost has a thousand races in the series? ADAM STEVENS: I do talk to myself a lot, but don't generally key up the mic when I do it. It was reminding him of the situation we were in. A couple of the cars, we had to go tail end, but a couple of the lap down cars waved over for us. I think we restarted about 18th on the racetrack. The ground to cover was a lot, but it wasn't something we couldn't do. I felt like we had the best car. We had time on our side. I really expected to see at least one caution to bunch us back up. 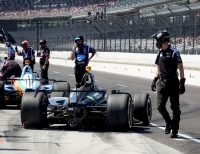 The last thing we wanted to do was him to not be aware of the situation and think we were a little bit more desperate than that, then put it five-wide on the top and drive it into the fence on the first corner. He has the ability to make lots of moves. Sometimes those moves don't always come at the right time. I just felt like it was the right thing to do to impress upon him we could get there without any Superman moves early in the run. THE MODERATOR: Congratulations on the triumph. Good luck next week in Martinsville. THE MODERATOR: We are joined by the race-winning car owner, Joe Gibbs. We'll open the floor for questions. Q. After the speeding penalty, Kyle took his time, but he made a couple of really bold moves. JOE GIBBS: I don't think he took his time. I think he was wheeling that thing. He made a couple of moves where I felt like holy mackerel. Really with a passion, the way he drives the car, we appreciate it so much. We had a speeding penalty this year like he felt cost him a race. I think he's an unusual athlete. If there's anything in front of him, he's driving a racecar, he's going to try to get it. That showed up today. Q. Does it give you chest pains when he's doing that? JOE GIBBS: I'm amazed really. You just realize the passion, what kind of skill that takes. It was a great charge from the back. See, here is the deal. Our car had been up front all day. Adam had been adjusting on a car that was up front all day. For us to be in the back, I wasn't sure we'd be able to handle traffic like that, get through there. Hey, somehow Kyle was able to get it done. Adam did a great job. 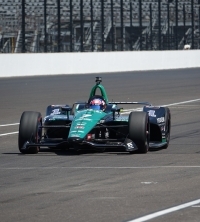 For me, when you see Interstate Batteries on that car, 27 years, they're our founding sponsor. I called Norm and Scott today, been with us for 27 years, just great partners. The thing about racing that I always like to emphasize, they're a huge part of our race team. You have Mars, Skittles last week, the Mars Corporation is a major sponsor. They get along great with Interstate. As even here knows, it takes a lot of resources to race cars at this level. We're so fortunate with our race team. Then we have Toyota as a partner. I just appreciate it. So many people get to celebrate this. I've been on phone calls talking to everybody at Interstate, everybody at Toyota, certainly at Mars. I think about all the people back home. Coy and I are out here. We get to celebrate this. J.D. I feel like is a part of our race team. He's got a way to look down on us. Certainly everybody back home. We just all celebrate this. It's a huge deal for us. When I think about it, J.D. spent 27 years of his occupational life, this is all he's done, to build the race team. It's a huge emotional thing for all of us. Q. How special of a talent is Kyle? Can you compare him to any racecar driver or athlete you may have seen on the football field? JOE GIBBS: I'm always leery when people ask you that. People say, Who is the best, all this kind of stuff. I'm always leery of that because there's been so many great drivers in NASCAR through history that have built this sport. I noticed Kyle said the same thing. I do know he's unusual. He's got a real gift. As a part of that, there's a determination and a competitive attitude he has that you just don't find very often. Because of that, I think he's accumulating all the wins that he has. Q. There's no doubt Kyle has talent behind the wheel. He has a lot of leadership outside of the Cup series, like when he ran the Truck team, recruiting drivers. Do you feel that overlays driving? JOE GIBBS: I don't quite understand. Q. Maybe he sees someone that has a little bit of him and wants to develop that. JOE GIBBS: I definitely think with young talent, I'm talking to him all the time. One of the keys, you got four guys up there, who is the next star, is there somebody that is a superstar. I think Kyle has a real feel for that. He found Erik Jones in a late model race. I go to him, talk to him all the time about talent, what do you think about these guys. I think he's have intuitive when it comes to young talent. I think he's really good at it. I think his Truck team is a place where a lot of young guys are getting their chance. Q. Kyle and the Toyota Camry seems to be a perfect combination. From a technical point of view, I couldn't believe the speed. The Fords and Chevys had no chances. Is there anything magic with the Camry, why the car is so much faster? JOE GIBBS: I actually think coming into the race, everybody here would have said the Fords were the fastest. Everybody felt like it was going to be a Ford day. It kind of goes back and forth. The Fords have been very quick. Joey has won, Brad has won. I think it kind of goes back and forth, who gets hot, who has the car for the day. That's the reason why it's so competitive up here at this level. But I do think, like I said, I know the Fords have been really good. I think Kyle felt like he was pretty good, but I really felt like the people I talked to on our race team, the Fords were probably the fastest of the field for this weekend. Q. Throughout the season everybody thought the racing was going to look a certain way, it didn't. Does it ever cease to surprise you all the predictions through all sports, they don't seem to come true that often? JOE GIBBS: Pro sports, I've said this numerous times, in football when I was there, now that I'm in racing, I said they're both very unpredictable. I think it's because the best people in the world are doing it. All it takes is a little bit to slip one way or the other, in either sport. It's easy to fall off. '15 we had a horrible year. It can happen to you. I said, too, that the pro sports, the two I've been in, they change at roughly 30% a year. You think about our sport. We have segment racing, changed everything, the Playoffs the way it is now, come out with a new package. I think you make a good point, and I think somebody asked Kyle that last week, he said you're just going to have to wait because we don't know. We all were looking at it, I bet this is what is going to happen. It surprises you when you really get in traffic and you get racing. I think what's going to happen after eight, nine, ten races, we'll have a feel for this. I do know that NASCAR will keep working on the racing package. We're just going to keep doing that because we're going to try to get the best racing. What you really like to have, always reward the best car for the weekend, you'd like to do that. You'd also like to have a lot of racing and a lot of changes of leads. We're all continuing to work towards that. I think it's a work in progress. But I think pro sports, if you look at the NFL, everything that's happened over there, the concussion thing, changing rules, pro sports, they're constantly changing. I think they're smart people in charge. I think they're trying to address things and make it better for the fans, attract the fans. Very important. We got a great fan base. I appreciate coming to L.A. because this is a huge deal for NASCAR, being here, having that fan base today. It's a big deal for us. Q. The last 50 Cup races, Kyle has won 13. That's a ridiculous 26% winning percentage. How do you explain that with all the changes, one guy winning a quarter of the races? JOE GIBBS: Take a look at football. We have something going on over there. We got a team that's dominating things. I think lots of times in pro sports, when somebody is kind of dominating something, they have the biggest growth because everybody is trying to beat them, pulling against that person or that team. I just think Kyle and Adam have kind of hit it. We all know how hard that is because how long does a driver and a crew chief stay together. We all see it play out. I think they're an unusual pairing. Adam is very strong. He'll step out there with Kyle, does a great job of leading. I think Kyle is very gifted. Does that mean it's going to keep going like that? No. We got off to an unbelievable start. This is fantastic for us and our race team. The thing that you can count on in pro sports, everybody's coming, everybody's after it. You look at all those race teams out there, how good they are, Penske, Hendricks, the guys are coming after you. That's what makes it so exciting. I think you made a good point. We don't know what's going to happen from week-to-week. Q. The Hall of Fame coach of the Washington Redskins compared his drivers to the New England Patriots. JOE GIBBS: I did not. I did not mention that name. I just said it does happen in pro sports (laughter). THE MODERATOR: Coach thank you. THE MODERATOR: We are joined by the winner of today's race and 200 NASCAR national series races, Kyle Busch, driver of the No. 18 Interstate Batteries Toyota for Joe Gibbs Racing. Q. They say nothing is as special as your first win. This has to be very special. How do you compare your first win to this today? KYLE BUSCH: I don't know. That's so long ago. I remember a little bit about it obviously. I don't know. I mean, I think the emotion of it on the first one was way greater just because it was the first one. I mean, my mom was in tears today. She was in tears on the first one. I don't know how many of the in between 198 she was in tears for. It's just been a crazy ride. To get 200 here today at Auto Club Speedway is pretty cool. I mean, to bookend number one and 200 here at the same place, pretty crazy. Same asphalt, this place hasn't been repaved. Just being able to win, it's what it's about. Q. I heard you say about a comparison to Richard Petty. You brought up LeBron and Michael Jordan. How do you compare them to Richard Petty? KYLE BUSCH: Somebody asked me about whether or not I was the greatest of all time. I'm never going to self-proclaim that. That's for others to debate. LeBron James is really good in basketball, so is Michael Jordan. Arguably, which one or the other, could be the greatest of all time. In this day and age now any more with how many eras we've been through in racing, basketball, football, whatever, if there is truly a greatest of all time? I think there's obviously greats. I would just like to be attributed or in that mix of the top five, top eight guys. I think by the time I'm all said and done, I could be in the top two or three of those guys of greatest of all time. I think it's going to be really, really hard to exactly pinpoint how you can define 'greatest' when that time comes. Q. Earnhardt told Jeff Gordon early in his career, Don't worry about what the fans think, as long as they're making noise, you know you've hit on something. Fans also like winners. KYLE BUSCH: Do they (smiling)? They booed the hell out of Earnhardt for the longest time, Jeff Gordon, Jimmie Johnson. Q. Do you feel your fan base picking up with your winning percentage? KYLE BUSCH: I feel like my fan base has been picking up over the years, growing up a little bit. I turned off plenty in the early days. You're never going to change those minds, which is fine. There's certainly some turning the table or the corner a little bit as to seeing about more of what's today, who I am today, the growing up that I've done. Overall I think winning obviously kind of helps that. I certainly have to give a huge shout out and praise to the Rowdy Nation fans that have been with me since the beginning, that have been with me since the Kellogg's days, my Xfinity days before I was a Cup guy, whatever. Even in Las Vegas when we go out there, I sign autographs at M&M's World, there's people I see there that come out that I remember seeing at the bullring in Las Vegas, and they're still Kyle fans. Those are the core group that I certainly am very appreciative of, that are very passionate about me. Q. From your perspective, 200, do you feel like it's more important to other people than it is to you? Five days you're going to be in a truck at Martinsville, focused. What does 200 mean? KYLE BUSCH: This was win number 200, but there's so many of the 200 that are special or meaningful. I don't know how you can categorize or characterize all of them. People ask me, What is the biggest win of your career? I'm like, Well, I guess Homestead 2015 is probably the biggest, right? Where does number 200 at Auto Club Speedway stand? I don't know. Is it in one of the top 10 most memorable? Probably, because it is number 200, but just because it was. It's not like the Daytona 500, Coke 600, Brickyard 400, anything like that. It was one of our races on our schedule. It just so happened to be out here in California. They've all been cherishable for their particular reasons. I don't want to discredit any of them. I think this milestone is obviously a special one to me, to many of those that are around me, my wife, my son will one day be able to recognize that. Adam Stevens, my guys, many of the crews and crew chief people that I've worked with over the course of my career obviously feel something about it, as well, too. It's pretty cool to hear from those guys. Q. You were pretty open for years about wanting to get to 200. Now that that's been checked off, do you have another number in mind? Anything beyond this is just a number? KYLE BUSCH: I think anything beyond this is just another number. I mean, I could go lightly and say 250, or I could reach for the stars and say 300. What's wrong with that? KYLE BUSCH: I would be banned from all of them by then, exactly (smiling), if I won 100 Cup races. All right, you're done. Nobody from F1 is calling. That's about the only thing higher I guess that I could try to go do. Being close to 100 on Xfinity, that's what I said I'd quit at. The Truck stuff, being in the 50s, I'd love to be able to continue on with that, race my trucks. I like that, working with my guys, my team, my company. On the Cup side, as well, too. Somebody asked me, Is 100 a number? Sure, we'll set the next number on the Cup side at 100. It's going to be hard to get there, no question about that. You might as well set your goals high, go out there and strive to achieve. Q. Back to the Michael Jordan, LeBron thing. Jordan won six championships, LeBron has three. There's other records that LeBron has reached to put him in that GOAT conversation. In this sport it seems like we associate GOATs with number of championships. With you reaching this number today, do you think it's fair to talk about the greatest drivers of all time and focus on championships? 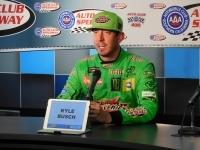 KYLE BUSCH: Yeah, to me, like I said, in different eras, there's so many different things. Jimmie Johnson, he should be the GOAT, the greatest of all time. He won the most championships in the most different ways of having to win a championship, in the most different cars he had to be able to drive to win races. Before 2004, it was always the whole season was the champion, right? Now we had the 10-race Playoff, now we have three, three, three, and then one. Unfortunately for me I've made it to the final four the last four years and only won it once. I feel like LeBron James, where I can make it to the finals, but once I get there, I can't quite close it out, get it done. Like I said, you said it, too, so many comparables, not every single one person is going to have every single one of them, right? This guy has this, this guy has this, that guy has that. I think that makes it to where you can't always say there's the greatest, but there's greats. Q. I heard you mention Formula 1 a couple times. If the doors ever opened, the opportunity to walk away from NASCAR, an opportunity from a good team, would you take that opportunity? KYLE BUSCH: They're going to have to spend a lot of money to buy me out of Joe Gibbs Racing, that's for sure. I don't know if it's worth their investment. There's probably too many things that those guys think about that we'd never be good at being able to drive those cars. I know Jimmie gave it a shot a couple weeks ago. Jeff has given it a shot. I'd love to be able to give it a shot and kind of see. I don't foresee the opportunity really blossoming and becoming something I can take advantage of. Q. What is your personal opinion, with a Toyota, will this increase your fan base in Japan? KYLE BUSCH: I'm number one in Japan, man. No question. Got that. Check (smiling). Q. Do you think personally there is a possibility you get a trip invitation to the headquarters in Japan to get a especially award? KYLE BUSCH: Unfortunately back when I won my championship, I was invited over there. Just timing didn't work out. I wasn't able to get over there in order to go, see those guys. There's only one guy I need to be my fan over there in Japan, that's Akio. As long as Akio is a fan, I'm all set, good. I'm sure we have plenty of Japanese fans from Japan that are huge about being Toyota followers, supporters. It's cool to be able to have them over here. For as much influence as they have on the U.S. economy, the things they do building cars here in the U.S., nine or 12 different plants, over 60,000 employees, American employees that have jobs here, pretty remarkable. We wouldn't be in our position without their support, the men and women of TRD that do such a great job to get us to the racetrack. KYLE BUSCH: Please don't say that word. I don't need him to have any. Q. After you got pushed back in the field, you made a couple of bold moves. What did you see that said you could make that move? KYLE BUSCH: How do you term this? You know how in movies when you go into the head of somebody that has that vision, it's got like a fighter jet vision, you can see? I have that. I can see the gap. I can see exactly how wide the gap is, to know how wide I am, I can fit that gap. I have that vision (laughter). Okay, that wasn't funny. Moving on. When I go and get a run, I see opportunities to make some of those moves, it's whether or not the gap looks big enough. If it looks big enough, I'm going for it, shooting it. If it closes up, we might wreck. Fortunately the guys up top on the spotter stand get a lot better at knowing I'm a crazy idiot. They'll tell their drivers to leave room sometimes so I can get through there. Q. At what point did you know you were going to win? KYLE BUSCH: It was before the race started (smiling). Serious question. What was the question? When did I know I was going to win? I don't think you ever know when you're going to win. The relief sets in when you take the white flag because you know you're coming back no matter what to end the race. That's kind of when the relief sets in. You're hearing every single little noise in the racecar, things like that for the last 20 laps of the race. You're hearing rocks flying up in the quarter panel thinking, is that rubber chunks, is the tire coming apart? It's crazy, you hear everything you don't want to hear in the final 20 laps. I am a journalist/photographer/member of AARWBA and a member with the Motor Press Guild both since 1990. I am an aerodynamicist with 28 years of aircraft design and flight test experience besides consulting on vehicle cle aerorodynamics having spoken at over 35 universities. I am an FAA certificated commercial pilot with multi-engine and instrument ratings who recently got FAA endorsed as second in command (SIC) in the Gulfstream G-IV corporate jet. President/Founder of Vehicle Aerodynamics Consultants, Inc. whodd site can be found at Aeroseminars.com where I consult on a variety of vehicle aerodynamics projects from radio controlled vehicles like TRAXXAS’ XO-1, bicycles, world land speed record vehicles, Mach 3 target drones, motor vehicle stunts or the automotive industry's OEM Tier 1 suppliers besides designing and flight testing for various aircraft corporations.